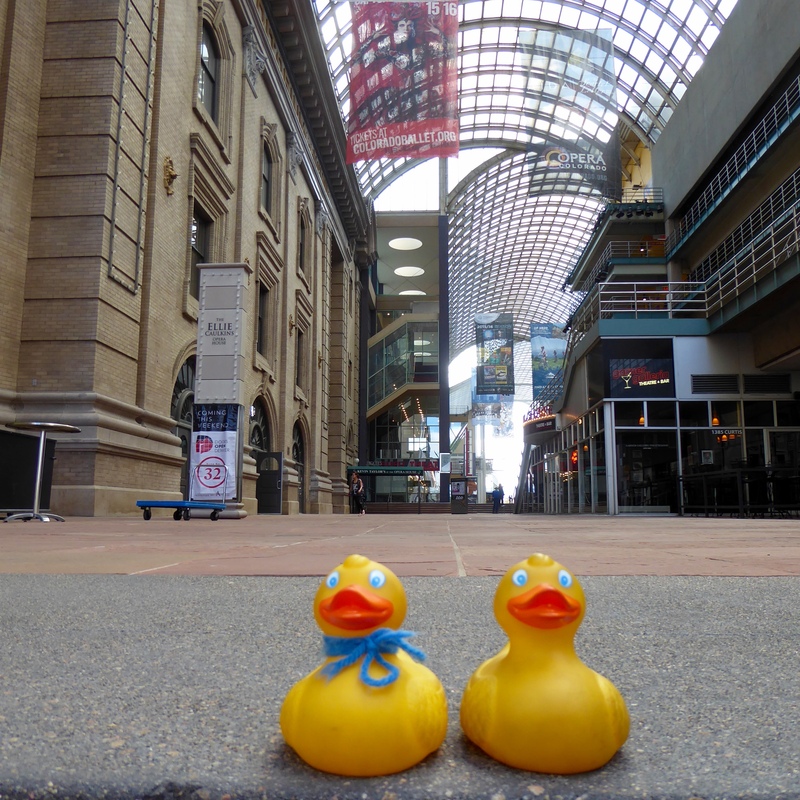 Colorado Traveling Ducks and their humans enjoyed a Segway tour of downtown Denver a week ago during our beautiful spring weather. We met John, our tour guide and Segway instructor. 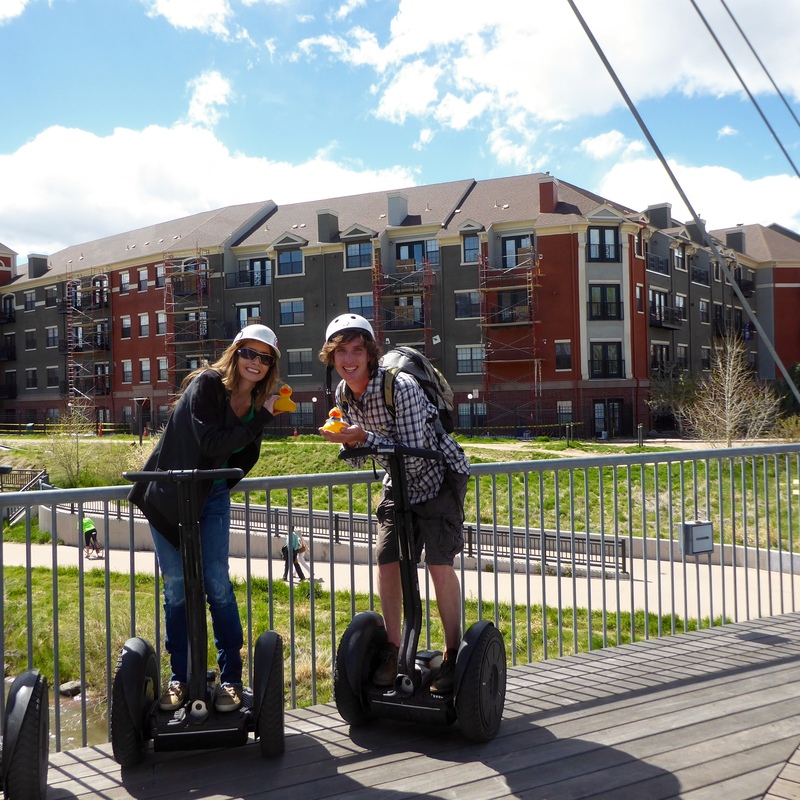 Five humans and two of the Colorado Traveling Ducks learned to glide on their Segways. This is so much fun! 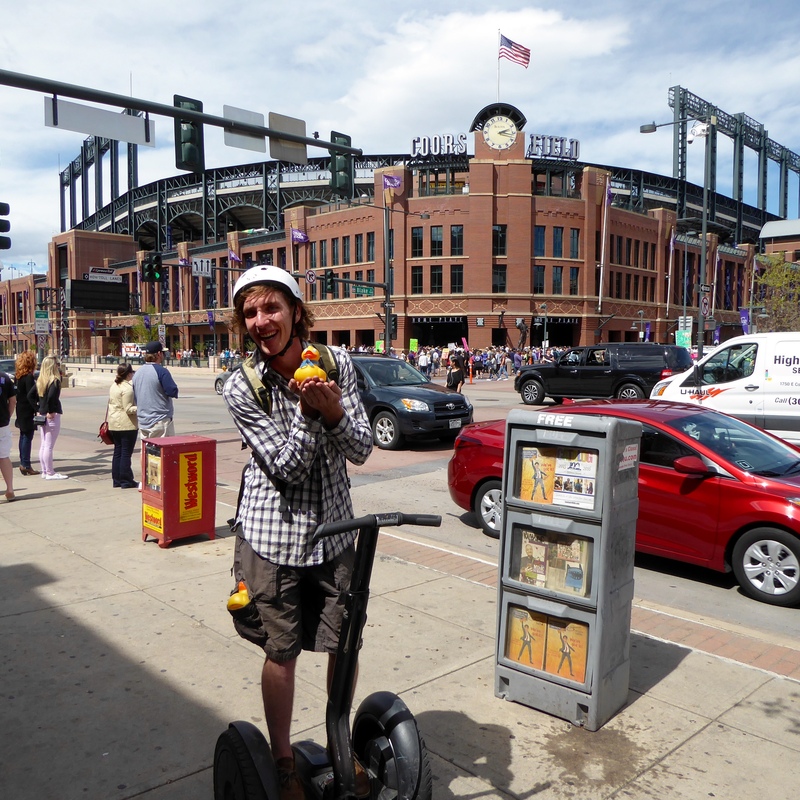 We cruised to Coors Field, home of the Colorado Rockies baseball team. The game was about to start and we rode through the crowd without a single accident–not even a close call. Coors Field, home to Colorado Rockies baseball team. Game starts soon. John coached us well. Did you know that in Coors Field there is a row of purple seats. These seats are exactly a mile high. Yes, Denver really is the Mile High City. Coors Brewery is located a few miles west of the stadium in Golden, Colorado. One of the beers brewed by Coors is Blue Moon. Under this stadium is a room, directly under first base, where some Blue Moon is brewed. If you order a Blue Moon beer during the baseball game, you will get the freshest beer you will ever be able to purchase. Very amazing isn’t it? Stopping on a bridge for photos, we then headed to the bike path behind us, gliding along the Platte River. Along the Platt River we saw several humans on bicycles, several walking, some kayakers on the river, and REI, or Recreational Equipment, Inc. 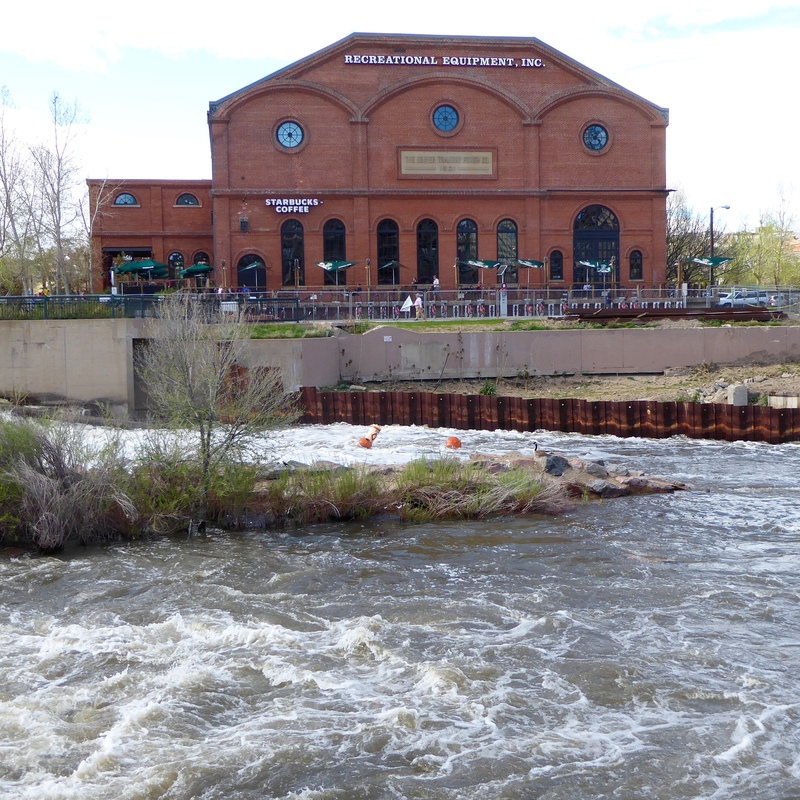 Located here on the river, with an outdoor patio and Starbucks REI offers refreshments with a view. REI and Starbucks on the Platte River and a goose in the river. A great location for relaxing and enjoying Denver. After the bike path, we headed back downtown. This is the Denver Center for the Performing Arts Complex. We have enjoyed performances at several of the theaters here and have loved them all. Nearby is the Denver Convention Center. The big blue bear looks in the window to see the activities. John put Zeb and Soapy Smith Duck in the tree so the Colorado Traveling Ducks can watch the big blue bear. We think this big blue bear is our friend. Our next stop is by Plumb Bob Brain. This two sided head has a golden builder’s plumb bob instead of a brain. The Plumb Bob is a tool used to obtain true vertical in construction. We think this is very unusual, but rather interesting. You can see the Colorado State Capitol Building in the background. Back on the Segways, we drove across Civic Center Park and gazed at the Capitol Building. One of the cement steps to the capitol building is exactly one mile high. The step is marked so you will know when you are exactly a mile above sea level. In the early days of Colorado, much of the territory and later the state was involved in mining. Gold, silver, other minerals and gems were mine here. 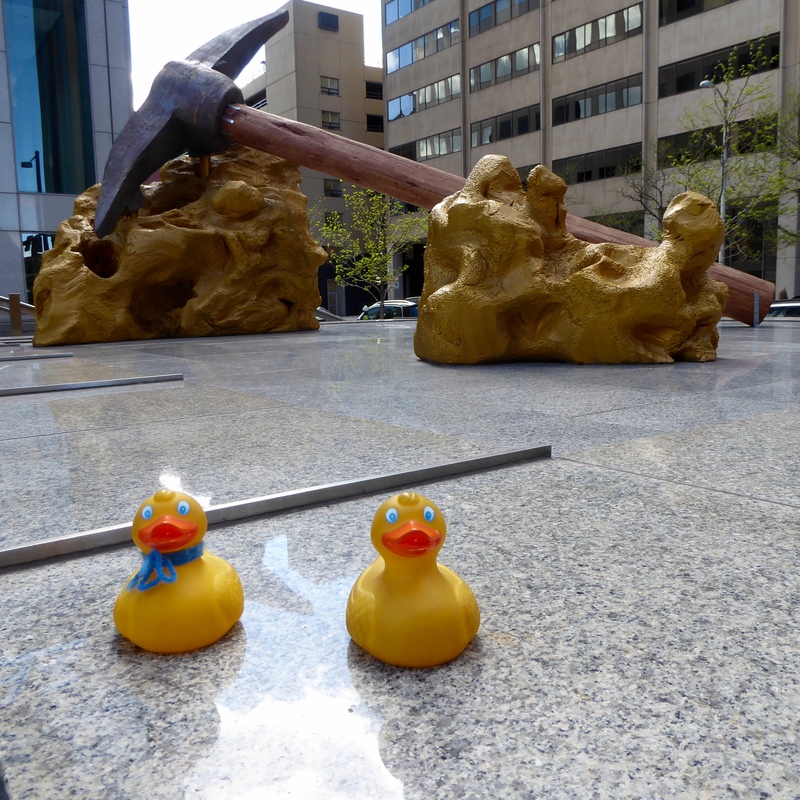 This huge pick and gold nugget are a tribute to our mining heritage. 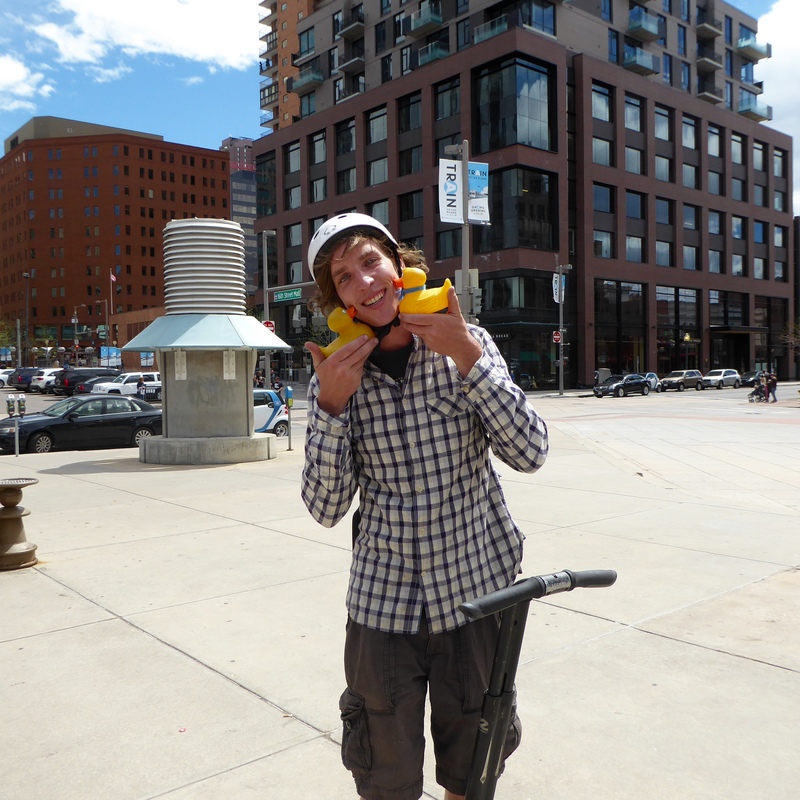 Our tour ended and we returned to our starting location in Lower Downtown, or LoDo. Thanks John and Rocky Top Glide for a wonderful afternoon. For more information visit http://www.rockytopglide.com To complete our day, we had dinner at the Cheesecake Factory. As always the food was very good and the cheesecake is outstanding. 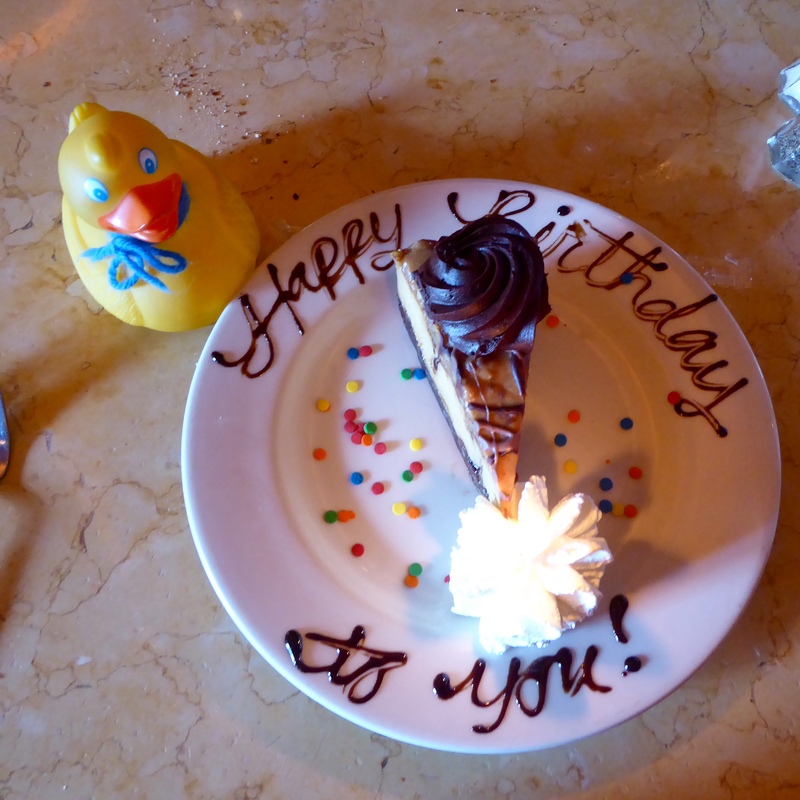 The next time you are planing a birthday dinner, consider the Cheesecake Factory. The cheesecake dessert was served on a plate with Happy Birthday to you written in chocolate syrup. We hope you have a birthday celebration at the Cheesecake Factory. 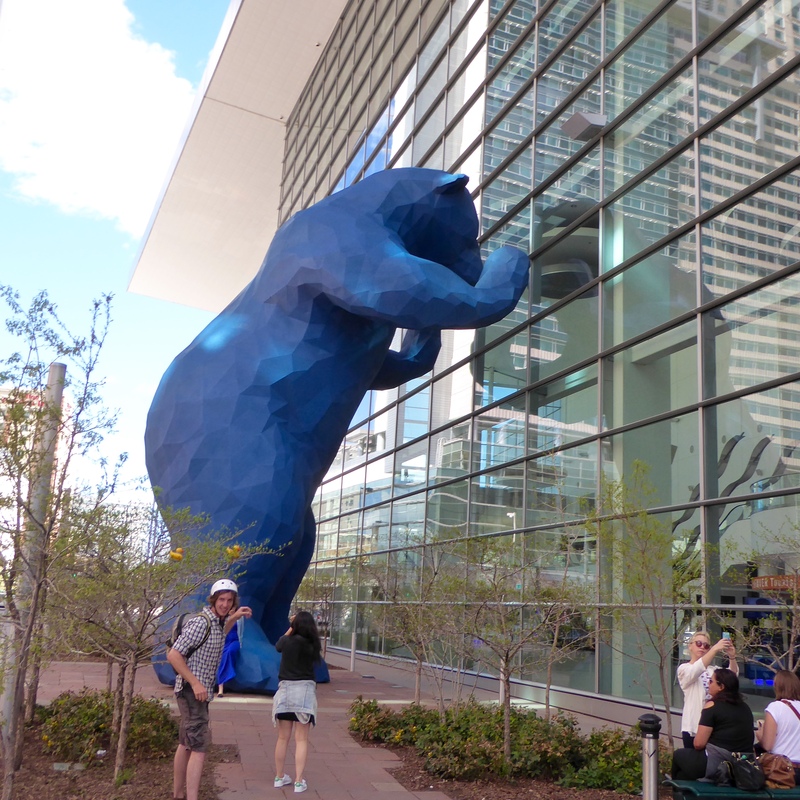 This entry was posted in Colorado, Uncategorized and tagged big blue bear, Blue Moon beer, Center for Performing Arts, Cheesecake Factory, Civic Center Park, Colorado, Colorado capitol building, Colorado Traveling Ducks, Coors Field, Denver, Denver Convention Center, gold mining, Platte River, Plumb Bob Brain, REI, Rocky Top Glide, Segway tour. Bookmark the permalink. Terrific pictures – and clearly loads of fun! It was so much fun. Hope you try one soon. Thanks for reading and commenting. Question? How does the homeless duck look? DTD is forgetting the people in the process of moving up the financial and political ladder. 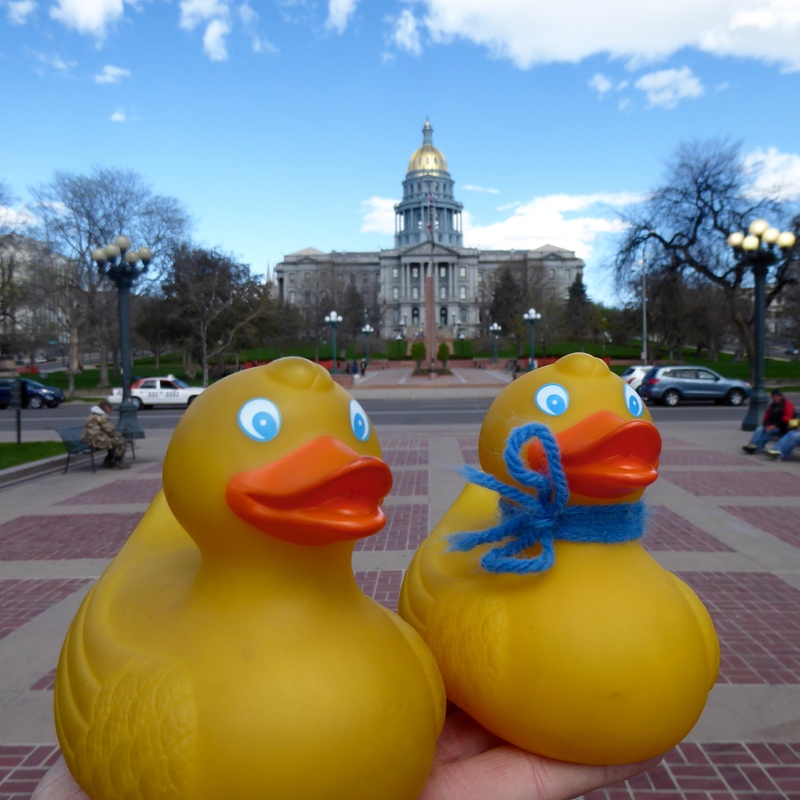 We hope the Colorado Traveling Ducks are never homeless. Thanks for reading and commenting. My goodness Ducks, how adventurous you all are. Did you consider carrying that giant gold nugget off? You could retire on the proceeds. It was so much fun. You and my friend, Justin, would love it. 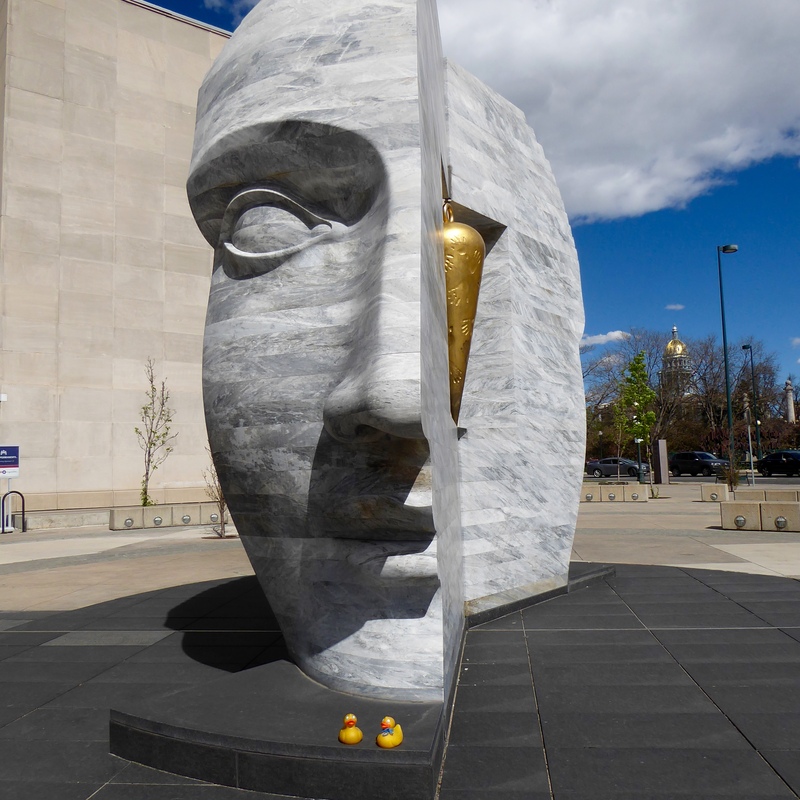 We tried to get the gold, but it was too heavy for ducks. And John, our guide, was watching us pretty closely. Thanks for reading and commenting.